Some of the ladies I knit with are knitting up squares that will be sewn together as a wedding gift for the daughter of one of our members. This is a very cool idea. The major setback, as I see it, is gauge. We all began with size 6(USA) needles and patterns from Barbara Walker’s book ‘Learn to knit Afghan’. Many of us were coming up with squares that were way too big. The ideal was an 8.25-8.5″ square. Depending on the stitch pattern, my needle size ranged from a 4-6! None the less, this is a super fun project for a group. Each square will contain the knitters style, gauge and vibe. The first square I knit was good. I did not care for how tight my knitting was, but it worked out to be the right proportion. The second square I really did not like at all. The pattern was not fluid and I don’t think it will translate well to an afghan. The square I am working on now (a diamond pattern) is very fun. I like the pattern a lot! After a few repeats, you can get the hang of the pattern and can work without written instruction. 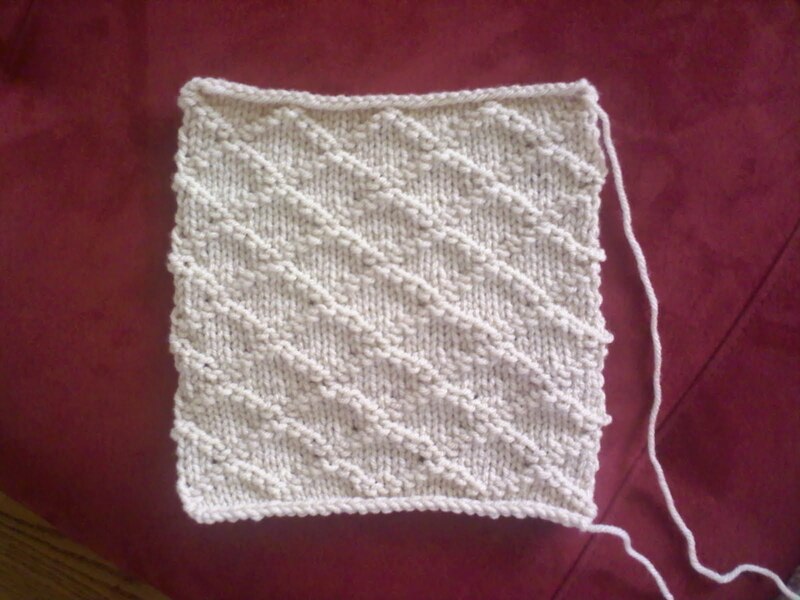 The square will be nice and symmetrical and fit nicely into an afghan. This is my first square. I like the outcome, but wish it weren’t so tight. 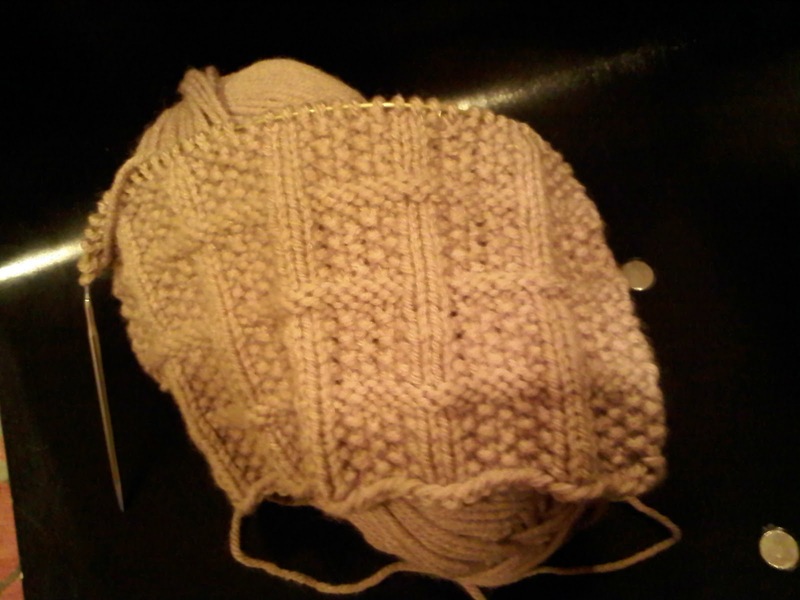 ﻿﻿﻿﻿﻿ This is the second square, Triangular Rib. I have blocked it to shape, but if you notice the two outer ribbed sections and the one central rib; these make for a very compact square. I would have chosen something different if hind-sight were fore-sight. This is the latest one. The yarn is a lighter color. The pattern is basically Stockinette Stitch with a Garter Stitch Diamond Pattern. I love this pattern. It is fun; not frustrating. The chart is easy to read and mistakes (if I made any…lol) are easily fixed. I hope to continue posting photos of not just my squares, but those of the ladies in the group. Everyone is doing such nice work. I cannot wait for the Bride-To-Be to see her wonderful afghan. I have to say, this is my favorite square so far. What frustrated me about the Triangular Rib was completely absent from this square. The pattern is textural without being busy. The pattern was easy to get the hang of and I think it lends itself beautifully to our project for its smooth edges and flat presentation. I had a thought today. Yes, just one! :). The idea of knitting squares, whether for a sampler blanket, or for dishcloths/pot holders, is a fantastic way to ‘get to know’ a stitch pattern. Too often I have embarked on a project that looks lovely, only to discover the stitch pattern within the design is a real test of my sanity! I am the kind of knitter that wants to work on patterns that I enjoy. Sitting and knitting while thoughts of ‘I hate this flipping pattern…I hate this flipping pattern’ bubble and rattle around in my head seems, I dunno, contrary to why I knit. Not to mention the mess I would make on my project if I impaled myself with a needle out of despair. So here is my plan. 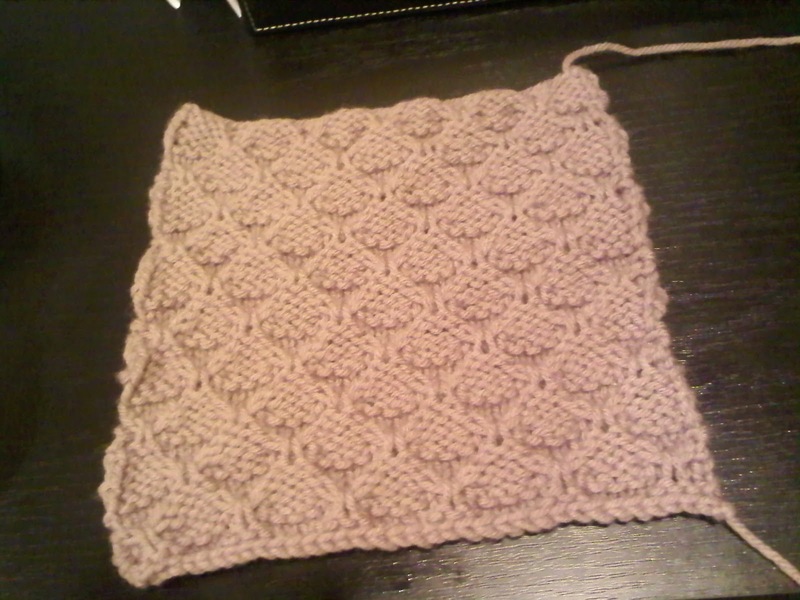 Work a square of the stitch pattern for my next project, either for a dishcloth, dolly blanket or hot pad for coffee. If I have homicidal thoughts, pan it; on to the next. So, as I mentioned earlier, that was my thought for the day. My work here is done. I am off to cast on a pattern called…dunno…I maxed out my thought quota. Next Next post: Kate is a genius!